Bigg V was born and raised in Leland, Mississippi. Growing up as a youth, he always had a passion for music. In his early teens, Bigg V became one of the youngest party promoters in the Mississippi Delta. While in high school he landed an intern position at WBAD (94.3) and WESY respectively. In order to fund his love of DJing, he worked many odd jobs such as mowing lawns, painting cars, party promotions, etc. to purchase equipment to better his craft of becoming a better DJ. Soon after graduation, he joined the Navy. As a member of the Armed Forces, he served as a Military Aircraft Electrician on USS JFK (CV-67) and serviced F-14’s, EA-6B’s, A-7’s and many helicopters such as MH-53. He served duties in both Operation Desert Shield and Desert Storm. After touring the world, Bigg V returned home, as a U.S. Navy War veteran; to pursue a career in the music business. A few months later, he obtained a sales position at the local radio station while DJaying at various clubs throughout the Mississippi Delta. As his popularity grew, he began to develop Hip-Hop/Rap/R&B talent and build the local club scene. Bigg V’s music interest varies from classical to crunk. He assisted in breaking some of the hottest records from David Banner, Project Pat, Papa Duck, Yo Gotti, Yung Joc, Rick Ross, La Chat Future, 2 Chainz , and Big KRIT just to name a few. 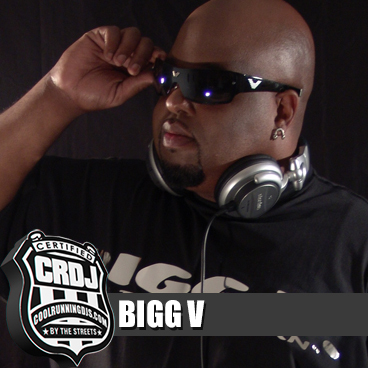 In 2007, Bigg V became a member of the Hittmenn DJs, the world’s biggest record breaking coalition. He’s also been featured in several Hip-Hop/Rap publications such as Ozone Magazine, New Power Magazine, Block to Block Magazine and the S.E.A. Magazine. In addition to the national exposure he’s garnered, Bigg V earns multiple nominations, on a yearly basis, at the Southern Entertainment Awards. He’s also a member of the Coolrunning DJ'S and Team Bigga Rankin Music. Furthermore, he was the youngest black General Manager at Delta Radio Inc. and overseen the daily operations of six radio stations (WDTL, WDSK, WZYQ, KZYQ, WOHT, WROX). At this present moment, Bigg V serves as the Assistant Director of Corporate Sales and Promotions Director at WCLD, WAID, WMJW, WKDJ for Radio Cleveland Inc. He’s also the Mixshow Director at Jammin 104 and Power 106.5 and one of the premier DJs in the country. In the coming year, he plans to continue building his brand and expanding his promotion company, Bigg V “The Doughman” Radio and Street Promotions by releasing his forthcoming mixtape series, breaking new records, concert promotions, clientele building, etc. amongst a host of other successful business endeavors.